Match types are an important part of campaign management, choosing which match types and the ratio of Exacts to Broads is an important part of keeping an account manageable and has an impact on the reach of the campaigns and CPC paid. 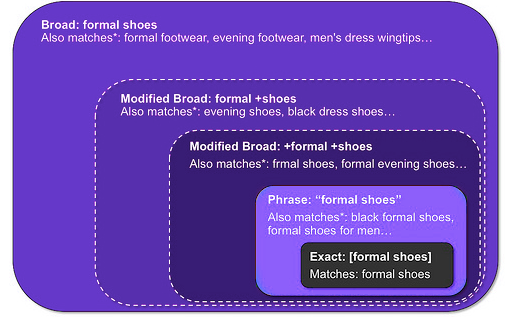 Google are to introduce two new match types. “Near phrase” and “Near exact”. These will bring the positive match types to a total of 6 (see below). this will not be available to all users straight away, Google will need to whitelist the account. While we are waiting for Google to officially release the details of how the new match types will work it is clear that they will increase the options for advertisers. Current understanding is that the “Near” phrase/exact will allow plurals and other close matches to the term that may help reduce the number of very close variations of a keyword needed. This could be a great move, Google have been honing their capability to Group and determine relevance of search terms to keywords. It will also increase revenue for Google by entering advertisers into more auctions. I am always in favour of anything that offers more options to an advertiser. We have had a few accounts white listed, and we have had a chance to see this match typing in action. Currently the way it works is that Exact terms, all become near exacts and phrase terms all become near phrase. Search query reports show the matching to be “broad” which makes it hard to analyse the performance unless you ensure there are no broads in the ad group or campaign you are analysing. So far the first apparent benefit is the matching to close misspellings, which is very helpful. We will be trialling this for the clients that have been whitelisted and update this blog with some comments later in the year.